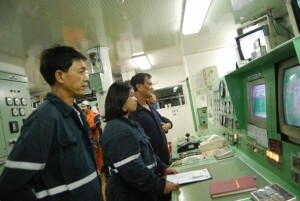 AMOSUP has carried out a survey on the health aspects of its women seafaring members. The survey, which was devised by the ITF along with Seamen’s Hospital Society, International Maritime Health Association, and the International Seafarers Welfare and Assistance Network, aims to improve health information and services available to women who work at sea. AMOSUP surveyed a total of 65 women seafarers at its Seamen’s Centre and Seamen’s Hospital from mid-April to September 2015. From the 52 accomplished questionnaires, representing 80% of the total distributed forms, it has drawn analysis from the women respondents. With an average age group of between 31-40 years old, 77% of the Filipino women in the survey worked as crew or ratings, with 81% of them in passenger or cruise ships. In terms of work assignment, 27% were at the hotel/reception/administration, 19% at the accommodation section and another 19% at the bar department. The result also showed that 54% of the participants handled supervision as part of their job, while the remaining 27% said that no supervisory was included in their duties and responsibilities. An individual’s health condition determines her functionality. Seafarer’s nature of work requires vigour and vitality. Thus, a good health is imperative for them to be able to perform their job well. Majority of the participants or 67% agreed that health challenges are work related. They ranked the top three health challenges from highest to lowest: joint pain or back pain, with 46%, followed by headache at 37% and 31% answered that stress/depression/anxiety was another big factor that affects their well being. Fifteen percent considered themselves healthy as they stated no health challenges. Likewise, it is important to note that 60% declared that they had no issues in accessing healthcare whether on board or in port. According to 37% of the respondents, their primary purpose in accessing healthcare was to have a better understanding of their health needs while 29% would like to receive health information only. As for the rest, 13% believed that their driving force would be assistance on how to access healthcare. Likewise, a guaranteed confidentiality about one’s health condition would encourage the other 12% and 6% preferred to be attended by female physician. In assessing healthcare, 42% of the respondents were interested in having routine wellness checks, 25% believed that vaccinations/immunisations and nutrition information were of equal importance. Since many of them answered joint and back pains as their top health challenges, 19% would like to be enlightened on this certain health condition. On the other hand, only 12% had blood pressure issues which could be attributed to the respondents’ age that was between 31-40 years old. As for their dental health, 13% would like to be checked or screened. With all the health challenges that seafarers face, 58% preferred to get information on health from the experts, the health professionals. Other sources of information such as reading materials in the form of leaflets, booklets and the like were favoured by 37%, while 21% said that information can be accessed thru online, apps or websites. Furthermore, working conditions were among the factors that affect an individual’s well being. A clean, orderly work environment is conducive for a worker’s health. In the survey, 96% of the respondents confirmed that sanitation was properly observed as sanitary bins were provided in the toilets. As regards to the issues on sexual harassment, 71% declared that bullying of a sexual nature was not an issue for them and the remaining 27% believed otherwise.